The program’s genome centers will generate data from participants of a wide variety of backgrounds to improve precision medicine. A look inside a lab at the Northwest Genomics Center, which will be conducting some of the genetics studies for participants in the NIH All of Us Research Program. The Northwest Genomics Center at the University of Washington in Seattle will become one of three genome centers around the country for the National Institutes of Health All of Us Research Program. The NIH announced the new genome centers this week. Please see the NIH news release. The All of Us Research Program is gathering data from participants from many backgrounds to create a national medical research resource for improving precision medicine. The data will take into account differences in lifestyle, environment and biology. The project aims to include 1 million or more people across the country. The Northwest Genome Center for All of Us will be led by Debbie Nickerson and Evan Eichler, both professors of genome sciences, and Gail Jarvik, professor of medicine in the Division of Medical Genetics, all at the University of Washington School of Medicine. The new NIH genome center will partner with the Brotman Baty Institute for Precision Medicine in Seattle, which unites UW Medicine, Fred Hutcinson Cancer Research Center and Seattle Children's. The Brotman Baty Institute studies the basis science behind why people vary in their vulnerabilities to disease and their response to treatments. This knowledge could eventually lead to more individualized healthcare strategies. She went on to explain that most large human genetic studies are at most only one percent of the population size of All of Us. Nonethelessthe findings from those studies are often implemented in patient care. With it’s size and breadth of data, All of Us is poised, she added, to uncover far more tailored approaches to medical treatment and prevention strategies, rather than one size fits all. Data from the participant community will empower researchers to learn how numerous factors – genetics, environment, habits and so on – might work together to affect health. The recently selected centers will generate genomic data from biosamples, such as blood specimens, contributed by program participants. This information, the NIH said in its announcement, will become a critical component of the All of Us platform to support work on important health questions. “This project gives participants the opportunity to contribute to an effort with leading edge genetics and genomics, and to be a part of bringing new approaches to health care to all Americans,” Nickerson said. “The project also is dedicated to sharing its findings with the participants, including returning their own personal results.” Initially these results will include information about a set of 59 genes associated with risks of certain diseases that are amenable to prevention or early diagnosis. Later this year, All of Us plans to announce funding for genetic counseling services. The Northwest Genome Center for All of Us at the University of Washington will bring together clinicians and basic science medical school faculty members in the Department of Genome Sciences, the Division of Medical Genetics in the Department of Medicine, and Colin Pritchard and Tina Lockwood, both associate professors in the Department of Laboratory Medicine. The Pacific Northwest has been at the forefront of human genetics and genomics research for many decades. For example, scientists here led the discovery of the genetic causes of hundreds of rare, Mendelian conditions. These are usually single-gene disorders that occur in a characteristic pattern of inheritance. 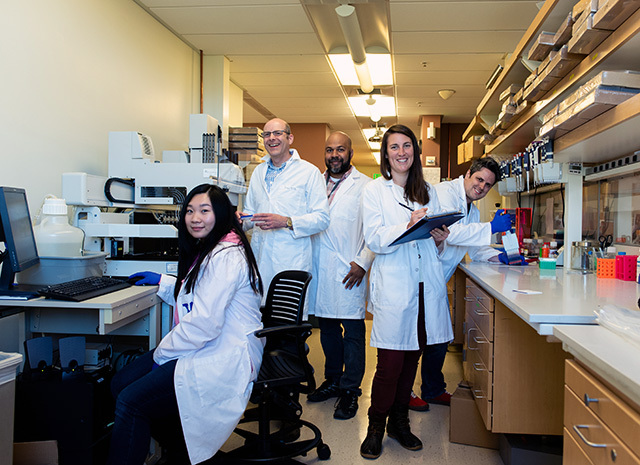 Members of the Northwest Genomics Center also led the discovery of new genes and pathways responsible for childhood autism. Among other achievements, several UW researchers have brought new understanding to the genetics of human drug response to prescription medicines, such as warfarin, an anticoagulant that needs careful dosage monitoring. UW scientists also have gleaned insights into the structure and function of the genome, and into the spectrum of variation in the DNA code of the human population. Northwest Genomics Center scientists with sequencers used for genetic studies. “Our institution was a pioneer in applying genetics to the study of rare and common diseases, and this new genome center builds on that strength,” Nickerson noted. Researchers from UW Medicine contributed to early efforts that became the All of Us Research Program. Jay Shendure, professor of genome sciences at the UW School of Medicine and director of the Brotman Baty Institute in Seattle, was on the panel for its preliminary development. Nickerson and Jarvik helped formulate initial plans for the genomics component and the return of results to participants. Shendure and Jarvik served on the institutional review board charged with advocating for the research participants and with determining safeguards, such as ensuring participants’ privacy and protecting the security of their data. One research participant in All of Us is the NIH director himself, Francis Collins. In his May 2018 blog entry, “All of Us Needs All of You,” he wrote that the program is open to everyone over age 18 in the United States, and that any adult, along with their families and friends, can join with Americans from all walks of life to help transform medicine. Participants, he explained, provide health information by completing surveys, sharing access with researchers to their electronic health records, providing blood and urine samples, and perhaps even putting on a fitness tracker or other wearable sensor. Eric Dishman, director of the All of Us Research Program at the NIH, said that the program’s hallmark is not only the diversity of people it wants to include, but also the diversity of data types. This would allow researchers to study many factors that influence health outcomes. The establishment of the genome centers is an important milestone, he said, in adding genotyping and whole genome sequencing data to other types of data already being collected. “Many people are curious about their genetic makeup,” he said. “This program will empower participants to learn more about their health, while furthering research for the benefit of us all. “We hope every adult in the Pacific Northwest might consider participating in this project,” Nickerson said.